Concrete joints are used to compensate when concrete expands or shrinks with changes in temperature. Concrete joints are normally used to prevent cracks when the concrete shrinks by creating forming, tooling, sawing and placing joint formers. The pre-planned cracks will provide a better finish concrete product and will be formed in specific locations where those cracks could be monitored. Sometimes because of the material and width or span of the concrete joints are required to improve the performance of the material and allow the materials to expand/contract or move without damaging other structures. Intended to create a weakened area in the concrete and regulate where cracks will occur, normally in a straight line. Contraction joints should be placed to produce panels that are as square as possible and never exceed a length to width ratio of 1 ½ to 1. Joints are commonly spaced at distances equal to 24 to 30 times the slab thickness. Joint spacing that is greater than 15 feet requires the use of load transfer devices. Contraction joints may be tooled into the concrete surface at the time of placement. Joints may also be sawed into the hardened concrete surface. It is important to understand that the longer sawing is delayed, the higher the potential for cracks to establish themselves before sawing is complete. Concrete expansion joints are used to separate slabs and concrete from other parts of the structure. Expansion joints allow independent movement between adjoining structural members minimizing cracking when such movements are restrained. It allows for thermal expansion and contraction without inducing stress into the system. Construction joints are used in circumstances where two consecutive placements of concrete meet. Construction joints are normally placed at the end of the day or be placed when concrete pour has been stopped for longer than the initial setting time of concrete. Construction joints should be designed and specified by a structural engineer. You can also achieve bond and continue reinforcement through a construction joint. If enough PCC is available at the end of the day, the construction joint can be placed at a planned transverse contraction joint. Maximum Joint Spacing should be 24 to 36 times the thickness of the slab. Joints should be spaced about 10 feet and a maximum of 15 feet. When using joint groove for contraction joints, the joint should be a minimum depth of ¼ thickness of the slab. Saw-cut joints should be done within 4 to 12 hours after the concrete has been finished. Keyed joints are not recommended for industrial floors. Dry-cut joints should be made between 1 to 4 hours after completion of finishing. The pre-molded joint filler should be used to separate slabs from building walls or footings. Place 2 inches of sand over the top of a footing to prevent bond to the footing. If the slab contains wire mesh, it is recommended to discontinue the mesh across contraction joints. Joint spacing should also be chosen, so that concrete sections are approximately square. It is recommended to have concrete joints along column lines either sawed or keyed. Metal dowels should be used in slabs that carry heavy loads. Plan exact locations of all joints including the timing of saw cutting. Use isolation joints between slabs and columns, walls and footings and where curbs or sidewalks meet other concrete structures. 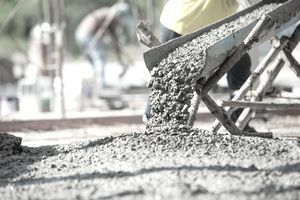 Materials used on concrete joints must be flexible enough to absorb or deform as needed and then being able to restore back to their original state. Always look for materials that are permeable and that can bond to the concrete. Hand Grover or Walking Grover: Depending on how large the slab is, you might want to choose one of these two. Cordless control joint tools: ideal for use on small to medium size projects. Concrete saw: ideal for saw cutting concrete, but be sure to know how deep that cut needs to be. Otherwise, you might be creating other problems.